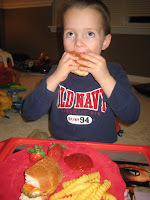 Raising Jack With Celiac : Cheeseburger with a BUN! Woohoo! Cheeseburger with a BUN! Woohoo! Yes my friends, it's exciting stuff! To see your child enjoy a cheeseburger with a bun is the little things in life that make me smile. My husband came home from the grocery store this past weekend with some Udi's Hamburger Buns so cheeseburgers were on the menu for dinner last night. Jack is only interested in eating cheeseburgers right now, he doesn't like chicken or fish, but I'm working on it! I'm just happy with the cheeseburgers - it's a start! we had Ore Ida Golden Crinkles French Fries which say "Gluten-Free" on the bag - I'm always a fan of that! Jack loves french fries! So with that said, I want to thank Udi's and Ore Ida for creating GF products that are readily available at my regular grocery store. I do most of my shopping at Kroger and I'm so happy they have a Udi's section in the bakery. Not having to drive across town to a specialty food store to purchase gluten-free products makes for a happy mamma! We look forward to cooking on the grill this summer and enjoying more cheeseburgers WITH BUNS as a family!